Anti-vax viruses, awesome APODs, nutty Necronomicon, super Sagan day, interesting imps and more! Anti-vaxers are sending viruses through the mail - Having their babies get sick is good (regardless of the legal aspects)? A fantastic APOD - Awesome astronomy pics, not only of space objects. Religions and cults based on the Necronomicon - Flan’s last thread. Editor’s Choice: Happy Carl Sagan Day! - Celebrate the most important science educator of our time. A Visual History of Whispering Imps On Magic Posters and bonus pick Vintaga’s Collection of Classic Magician Posters — Perhaps I’m a couple weeks off on this pick. It would have been a good one for Halloween. But in my world, where it comes to stuff like magicians and spooky magician posters, every day is Halloween. I do love conjurers, and the skeptical world happens to be filled with them. I love being fooled and I’m willing to pay for the entertainment of being fooled. “Entertainment” being the key word in that last sentence. But this pick is not about fakes and psychic spoon-bending frauds vs. entertainers. It’s about the artful creation of other-worldly dark and spooky forces that magicians have traditionally used to playfully advertise their mysterious powers of conjuring and illusion in order to set the mood and draw us in. It’s a fantasy that we are both aware of and happy to indulge in. For the time we spend being wowed by magicians, just as it is with any fantasy or science fiction novel we may indulge in, we are willing to suspend reality just for the fun of it. We know, if we have an ounce of sense, that it’s the magician’s job to fool us. And if we are well-fooled, we love them for it. A Visual History of Whispering Imps On Magic Posters is a collection of posters with the popular theme of devilish creatures whispering secrets in the magicians ear, or maybe appearing on the posters as the devilish power behind the magic. In either case, their place was on the poster and not in the magician’s act. 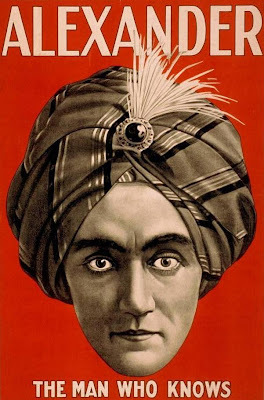 The Image of the sagacious magician looking knowingly at the viewer with small imps whispering the enduring secrets of magic in his ear has been often used on magician’s advertising posters. 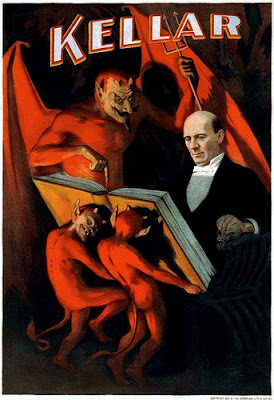 This image of the magician getting the “secrets” from these underworld demi-devils apparently started with Harry Kellar (on his 1894 poster). Leon Hermann (nephew of Alexander) who overlapped the career of Kellar seems to be the first who copied the whispering imps. Not only did the Great Hermann include them, he used more imps! Several of the imitators have been satisfied with a single informant but the standard seems to be two — one per shoulder. Keen’s informant is a great deal older — and may be Mr. Scratch himself. The poster that is probably the most famous and the one most often directly copied is the splendid Kellar poster. Thurston seemed to like the idea so much he used it three times, Raymond had two slight variations. It was used once on a book cover. Although many have directly copied Kellar’s imps (myself included), the wee devils show up with tails, wings, pointed ears and in the company of other underworld creatures. Banachek has updated the imps as space aliens. So on with the fun at, A Visual History of Whispering Imps On Magic Posters! 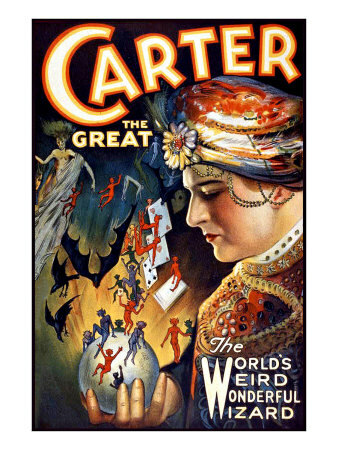 I have also included a bonus pick, Vintaga’s Collection of Classic Magician Posters because not all magician posters have “Imps” on them but they are all fun to look at. Plus if you really like one, you can buy it. I recommend that you click on the "Slideshow" button (in the upper right-hand corner of that page) and view the posters large and in order. You can get into a habit of thought in which you enjoy making fun of all those other people who don’t see things as clearly as you do. We have to guard carefully against it. Wednesday: The first most substantial thing in chat was Kil volunteering to channel Carl Sagan, but we also discussed the European economy, and compared it to the US and Canadian economies. As mundane as it seems, we also discussed the weather and the different climates of the locations of the chat participants. From Canada and Sweden in the north to the Virgin Islands in the south. Occupy Wall Street also got mentioned, and the point of using local banks and credit unions to force big banks to rethink their strategies. More American politics: the latest election seems promising. We hope that a measure of sanity will be returned to Congress. Still, a number of chatters believe the 2012 Presidential election will be rigged, and wonders if the movement toward left will be enough. Can today’s technology tackle climate change? Who cares? Exuberant Skepticism, by Paul Kurtz. “For more than three decades, philosopher Paul Kurtz has been a strong advocate of skepticism, not only as a philosophical position, but also as a fulfilling way of life. Contrary to the view that skepticism is merely a negative, nay saying, or debunking stance toward commonly held beliefs, skepticism as defined by Kurtz emerges reborn as ‘skeptical inquiry’ — a decidedly positive philosophy ready and able to change the world. In this definitive collection, editor John R. Shook has gathered together seventeen of Paul Kurtz’s most penetrating and insightful writings. Altogether these essays build an affirmative case for what can be known based on sound common sense, reason, and scientific method. And as each essay cogently and convincingly explains, so much can be known, from the natural world around us to the moral responsibilities among us. The work is organized in four topical sections. In the first, ‘Reasons to Be Skeptical,’ Kurtz presents compelling reasons why the methods of inquiry used by the sciences deserve respect. In short, science provides reliable knowledge, without which humanity would never have emerged from the age of myth and widespread ignorance. In the second section, ‘Skepticism and the Non-Natural,’ Kurtz shows how skeptical inquiry can be fruitfully used to critique both paranormal claims and religious worldviews. He also investigates whether science and religion can be compatible. In the third section, ‘Skepticism in the Human World,’ he considers how skeptical inquiry can be applied to politics, ethics, and pursuit of the good life. Realizing the essential connections between scientific knowledge, technological power, and social progress, Kurtz has understood, as few other philosophers ever have, how the methods of intelligence can be applied to all areas of human endeavor. There were 6,694 daily visitors this week.